Published on October 10, 2018 in Daily Dirt and Western Builder. Closed Tags: asphalt, bridges, construction, construction industry, contractors, economy, equipment, Federal Highway Administration (FHWA), Federal Highway Trust Fund, gas tax, heavy equipment, Highway Bill, highways, infrastructure, Interstate Highway System, jobs, National Highway Traffic Safety Administration (NHTSA), pavement, roads, safety, the American Association of State Highway and Transportation Official (AASHTO), the American Road & Transportation Builders Association (ARTBA), The Bureau of Transportation Statistics (BTS), the Congressional Budget Office (CBO), the General Accounting Office (GAO), the North Dakota Department of Transportation (NDDOT), the Texas Transportation Institute (TTI), the U.S. Census Bureau, TRIP, trucks. While increased transportation investment in North Dakota, largely as a result of the state’s energy boom, has allowed numerous projects to proceed, additional investment is still needed to improve road and bridge conditions, enhance safety and accommodate projected growth,according to a new report from TRIP, a national nonprofit transportation research group based in Washington, DC. The TRIP report, “Modernizing North Dakota’s Transportation System: Progress & Challenges in Providing Safe, Efficient and Well-Maintained Roads, Highways & Bridges,” finds that with the amount of energy-related revenues available for transportation decreasing, North Dakota faces a significant shortfall in funding for needed transportation projects. Energy-related revenue in North Dakota used for transportation increased from $216 million in 2012 to $619 million in 2017 before dropping to $194 million in 2018. The state faces a $2.5 billion shortfall from 2018 to 2023 in transportation funding needed to improve road, highway and bridge conditions, support economic development opportunities and improve roadway safety. 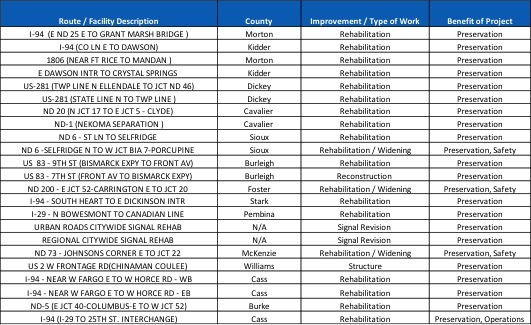 The chart below details needed transportation projects throughout the state that lack funding to proceed. Largely as a result of the state’s energy boom and subsequent decline, North Dakota experienced the nation’s greatest rate of economic and vehicle travel growth from 2000 to 2014, and the nation’s greatest rate of reduction in economic output and vehicle travel from 2014 to 2016. The state’s population increased by 18 percent from 2000 to 2017 and is expected to increase another 38 percent by 2040. North Dakota’s gross domestic product (GDP) increased 133 percent from 2000 to 2014, the highest rate in the nation during that time. However, the state’s GDP decreased seven percent from 2014 to 2016, the largest decline in the nation during that time. And while North Dakota experienced the largest increase in vehicle miles of travel (VMT) in the nation from 2000 to 2014 (46 percent), the state also experienced the largest decrease in VMT from 2014 to 2016 (seven percent). Energy extraction levels in North Dakota have begun rising again in 2018 following a modest downturn in 2016 and 2017, resulting in additional economic activity and vehicle travel in North Dakota, which will increase wear and tear on the state’s roads, highways, and bridges. Nearly two-thirds of North Dakota’s major urban roads are in poor or mediocre condition, with pavement conditions projected to decline in the future without additional funding. According to the TRIP report, 36 percent of North Dakota’s major locally and state-maintained urban roads and highways have pavements in poor condition and 28 percent are rated in mediocre condition. The average annual miles of roads resurfaced or reconstructed by the North Dakota Department of Transportation (NDDOT) will decrease by 24 percent from 2015-2018 to 2019-2022, largely due to reduced energy-related revenue. NDDOT estimates that the miles of state-maintained roads in poor condition will nearly double between 2018 and 2021, from 443 miles to 872 miles. According to the TRIP report, 14 percent of North Dakota’s bridges are structurally deficient, meaning there is significant deterioration to the major components of the bridge. The Federal Highway Administration estimates that it would cost $164 million to replace or rehabilitate all structurally deficient bridges in North Dakota. The average number of bridges NDDOT is able to reconstruct or replace annually will decrease by 46 percent from 2015-2018 to 2019-2022, largely due to reduced energy-related revenue. Traffic crashes in North Dakota claimed the lives of 643 people between 2013 and 2017. The state’s rural, non-Interstate roads are particularly deadly, with a traffic fatality rate that is more than four times higher than on all other roads in the state (1.79 fatalities per 100 million vehicle miles of travel vs. 0.42). The efficiency and condition of North Dakota’s transportation system, particularly its highways, is critical to the health of the state’s economy. Annually, $106 billion in goods are shipped to and from sites in North Dakota, relying heavily on the state’s network of roads and bridges. North Dakota’s roads, highways and bridges form vital transportation links for the state’s residents, visitors and businesses, providing daily access to homes, jobs, shopping, natural resources and recreation. The condition, efficiency and funding of North Dakota’s transportation system are critical to quality of life and economic competitiveness in the Peace Garden State. North Dakota has experienced a significant boom in energy extraction in its western counties that, since 2005, has resulted in a ten-fold increase in crude oil production, spurred by advancements in extraction technology and increases in fuel prices. While the state’s energy boom has resulted in a tremendous increase in wear and tear on the state’s roadways, it has also provided a significant boost in transportation funding. The modest decrease in energy extraction in North Dakota in 2016 and 2017, as a result of reduced energy prices, has significantly reduced the amount of additional energy-related revenue in North Dakota available for transportation investment. And despite the surge and subsequent drop in energy-related transportation revenues, North Dakota continues to face a significant backlog in needed funding for transportation, largely as a result of a lack of an adequate, dedicated state funding source for road, highway and bridge repairs and improvements. This report examines the condition, use, safety and funding of North Dakota’s roads, highways and bridges and the state’s future mobility needs. Sources of information for this report include the North Dakota Department of Transportation (NDDOT), the Federal Highway Administration (FHWA), the American Association of State Highway and Transportation Officials (AASHTO), the Bureau of Transportation Statistics (BTS), the U.S. Census Bureau, the Texas Transportation Institute (TTI), the American Road & Transportation Builders Association (ARTBA) and the National Highway Traffic Safety Administration (NHTSA). An increase in transportation investment in North Dakota, largely as a result of increased energy-related revenues, has allowed many needed road, highway and bridge projects to proceed. With the amount of energy-related revenues available for transportation decreasing, North Dakota faces a significant shortfall in funding for needed transportation improvements. From 2012 to 2018, $3 billion in state energy-related revenues were spent on transportation improvements in North Dakota. Energy-related revenue in North Dakota used for transportation increased from $216 million in 2012 to $619 million in 2017 before dropping to $194 million in 2018. The $3 billion in energy-related revenue used for transportation in North Dakota represents 63 percent of the $4.8 billion in state revenue provided to the North Dakota Department of Transportation (NDDOT), from 2012 to 2018. North Dakota faces a $2.5 billion shortfall from 2018 to 2023 in transportation funding needed to improve road, highway and bridge conditions, support economic development opportunities, and improve roadway safety. Largely as a result of increased energy-related revenues, NDDOT has been able to proceed with numerous projects to improve the condition, safety and reliability of its roads, highways and bridges. 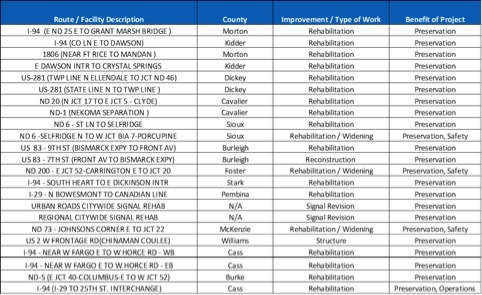 The chart below details North Dakota transportation projects that have been completed, are underway or will be completed by 2021 because of increased state transportation funding, largely due to increased energy-related state revenue. 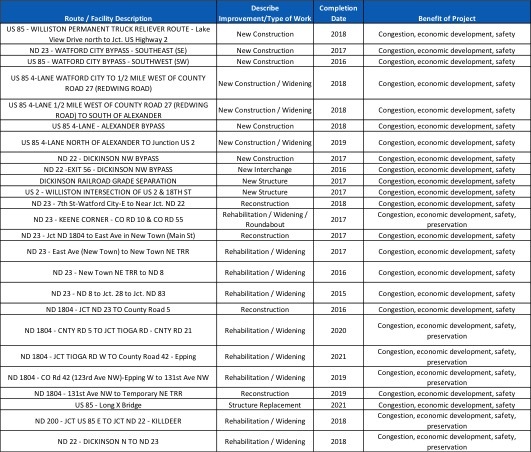 The chart below details needed transportation projects in the state that lack adequate funding to proceed. Largely as a result of the state’s energy boom and subsequent decline, North Dakota experienced the nation’s greatest rate of economic and vehicle travel growth from 2000 to 2014 and the nation’s greatest rate of reduction in economic output and vehicle travel from 2014 to 2016. North Dakota’s population reached approximately 755,000 residents in 2017, an 18 percent increase since 2000. North Dakota had 555,935 licensed drivers in 2016. North Dakota’s population is expected to increase by 38 percent by 2040 to 1,045,000, an increase of 290,000 people. From 2000 to 2014, North Dakota’s gross domestic product (GDP), a measure of the state’s economic output, increased by 133 percent, when adjusted for inflation, the highest rate in the nation during that time. From 2014 to 2016, North Dakota’s GDP decreased by seven percent, when adjusted for inflation, the greatest rate of decline in the nation during that time. Crude oil production in North Dakota increased from 98 thousand barrels a day in 2005 to 1.17 million barrels per day in 2015 before declining to 1.03 and 1.06 million barrels per day in 2016 and 2017, respectively. Vehicle miles traveled (VMT) in North Dakota increased by 46 percent from 2000 to 2014, the greatest rate of increase in the nation during that time. VMT in North Dakota decreased by seven percent between 2014 and 2016, the greatest decrease in the nation during that time. A lack of adequate state and local funding has resulted in approximately one-third of major urban roads and highways in North Dakota having pavement surfaces in poor or mediocre condition, providing a rough ride and costing motorists in the form of additional vehicle operating costs. The pavement data in this report, which is for all arterial and collector roads and highways, is provided by the Federal Highway Administration (FHWA), based on data submitted annually by the North Dakota Department of Transportation (NDDOT) on the condition of major state and locally maintained roads and highways. Thirty-six percent of North Dakota’s major locally and state-maintained urban roads and highways have pavements in poor condition and 28 percent are rated in mediocre condition. Eleven percent of major urban roads are in fair condition and the remaining 25 percent are rated in good condition. Eight percent of North Dakota’s major locally and state-maintained rural roads and highways have pavements in poor condition and 15 percent are rated in mediocre condition. Thirteen percent of major rural roads are in fair condition and the remaining 64 percent are rated in good condition. The average annual miles of roads resurfaced or reconstructed by the North Dakota Department of Transportation (NDDOT) will decrease by 24 percent from 2015-2018 to 2019-2022, largely due to reduced energy-related revenue. NDDOT estimates that the miles of state-maintained roads in poor condition will nearly double between 2018 and 2021, from 443 miles to 872 miles. Approximately one-in-seven locally and state-maintained bridges in North Dakota show significant deterioration and are rated structurally deficient. This includes all bridges that are 20 feet or more in length. Fourteen percent of North Dakota’s bridges are structurally deficient. A bridge is structurally deficient if there is significant deterioration of the bridge deck, supports or other major components. Structurally deficient bridges are often posted for lower weight or closed to traffic, restricting or redirecting large vehicles, including commercial trucks and emergency services vehicles. The average number of bridges that NDDOT is able to reconstruct or replace annually will decrease by 46 percent from 2015-2018 to 2019-2022, largely due to reduced energy-related revenue. 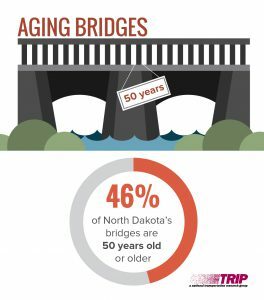 Most bridges are designed to last 50 years before major overhaul or replacement, although many newer bridges are being designed to last 75 years or longer.In North Dakota, 46 percent of the state’s bridges (2,030 of 4,377) were built in 1969 or earlier. A recent survey of states by the U.S. General Accountability Office(GAO) found that more than half of states surveyed (14 out of 24) reported that inadequate funding was a challenge to their ability to maintain bridges in a state of good repair. Improving safety features on North Dakota’s roads and highways would likely result in a decrease in the number of traffic fatalities and serious crashes. A total of 643 people were killed in North Dakota traffic crashes from 2013 to 2017, an average of 128 fatalities per year. North Dakota’s overall traffic fatality rate in 2016 of 1.16 fatalities per 100 million vehicle miles of travel is below the national average of 1.18. The fatality rate on North Dakota’s non-interstate rural roads in 2016 is more than four times higher than on all other roads in the state (1.79 fatalities per 100 million vehicle miles of travel vs. 0.42). Several factors are associated with vehicle crashes that result in fatalities, including driver behavior, vehicle characteristics and roadway features. TRIP estimates that roadway features are likely a contributing factor in approximately one-third of fatal traffic crashes. Where appropriate, highway improvements can reduce traffic fatalities and crashes while improving traffic flow to help relieve congestion. Such improvements include removing or shielding obstacles; adding or improving medians; the use of high-friction surfacing treatment to improve skid resistance; improved lighting; adding rumble strips, wider lanes, wider and paved shoulders; upgrading roads from two lanes to four lanes; improved road markings; improved signage and delineation at curves; and, improved intersection design. The current federal surface transportation program, which expires in 2020, falls far short of providing the level of funding needed to meet the nation’s highway and transit needs. Boosting federal surface transportation spending will require that Congress provide a long-term and sustainable source of funding to support the federal Highway Trust Fund. Signed into law in December 2015, the Fixing America’s Surface Transportation Act (FAST Act), provides modest increases in federal highway and transit spending, allows states greater long-term funding certainty and streamlines the federal project approval process. But, the FAST Act, which expires in 2020, does not provide adequate funding to meet the nation’s need for highway and transit improvements and does not include a long-term and sustainable funding source. Crafting a long-term federal highway and transit program to replace the expiring FAST Act in 2020 would likely require Congress to identify a long-term, sustainable source of funding to support increased funding for the federal Highway Trust Fund, which currently has a balance of $44 billion, but which is expected to reach a negative balance by 2021. The efficiency of North Dakota’s transportation system, particularly its highways, is critical to the state’s economy. A key component in business efficiency and success is the level and ease of access to customers, markets, materials and workers. The design, construction and maintenance of infrastructure in North Dakota are significant sources of employment in the state. 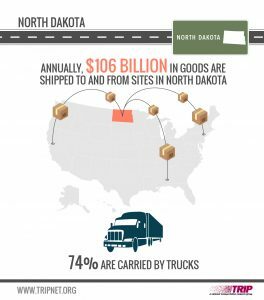 Annually, $106 billion in goods are shipped to and from sites in North Dakota, mostly by truck. Seventy-four percent of the goods shipped annually to and from sites in North Dakota are carried by trucks and another 11 percent are carried by courier services or multiple mode deliveries, which include trucking. The design, construction and maintenance of transportation infrastructure in North Dakota support 13,258 full-time jobs across all sectors of the state economy. These workers earn $667 million annually. Approximately 215,200 full-time jobs in North Dakota in key industries like energy, tourism, retail sales, agriculture and manufacturing are completely dependent on the state’s transportation infrastructure network. Increasingly, companies are looking at the quality of a region’s transportation system when deciding where to re-locate or expand. Regions with congested or poorly maintained roads may see businesses relocate to areas with a smoother, more efficient and more modern transportation system. Highway accessibility was ranked the number one site selection factor in a 2017 survey of corporate executives by Area Development Magazine. Labor costs and the availability of skilled labor, which are both impacted by a site’s level of accessibility, were rated second and third, respectively. Sources of information for this report include the Federal Highway Administration (FHWA), the North Dakota Department of Transportation (NDDOT), the American Association of State Highway and Transportation Official (AASHTO), the Bureau of Transportation Statistics (BTS), the U. S. Census Bureau, the Congressional Budget Office (CBO), the General Accounting Office (GAO), the Texas Transportation Institute (TTI), the American Road & Transportation Builders Association (ARTBA) and the National Highway Traffic Safety Administration (NHTSA). All data used in the report are the most recent available.